Hikari holding Rakka's glowing halo. 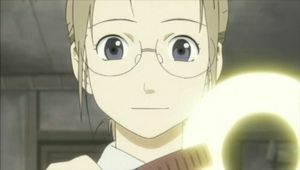 Hikari is a bit serious at times, but despite this she is probably the most mischievous of the haibane at Old Home. She tends to be cheerful and willing to help, but she doesn't always think things through first. She works in a bakery. Though not much in comparison to the two main characters, Hikari does get her bit of character development. In contrast to being carefree and irresponsible (once messing up at the Renmei's temple, per Reki's commentsin episode 3, and contaminating the halo mold with pastry) she grows to be a reliable senpai by the end of the series. For further information, consult your pineal gland this page. Not much is known about her dream except for the light. So far no combination has been found to be usable as her true name, therefore it is likely that the two are the same. Light being a symbol of purity might further prove this.